Good evening, I’m James Adderley and we’re certainly glad to be with you for this portion of Sports Monday. Week 2 in the PLB brought with it a full slate of 6 matches spread across the nation so we journeyed north to San Felipe where FC San Felipe Barcelona hosted FC Belize in a battle that can only be described as intriguing. The 1st real threat at goal comes from the home team some 10 minutes in when Gabriel Perez singles out Eduardo Morales with this long pass off the right wing but Elroy Rawley of FC Belize comes up with a timely intervention. At the other end, Thomas Castro’s launch atop the 18 is potent but fails to find the target. It’s more FC Belize when Jeremy Bermudez turns nicely against Gabriel Perez to serve up this beauty to Thomas Castro who should have done better with this chance at goal. 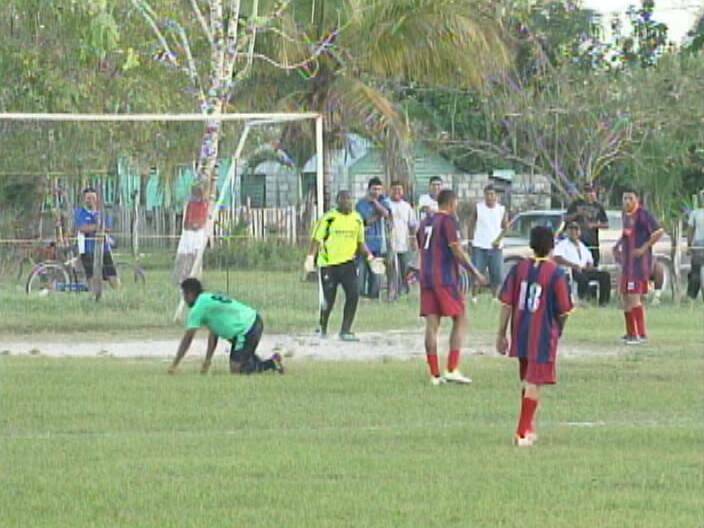 Still, FC Barcelona gets this wonderful opportunity to open the scoreboard when Oscar Acevedo outruns the FC Belize defense then waits to beat his man before firing which allows Ian Gaynair to make the successful tackle. In the meantime, this right foot bomb from Delwin Jones crashes on the wrong side of the target and at the half, the scoreless stalemate remains intact. So we go to 2nd half and its Oscar Acevedo unleashing this powerful right foot in a bit to give San Felipe the lead only to see it rise over the crossbar. Folk’s we’re at the 62nd minute when Ian Gaynair fails to come up with the defensive clearance; the loose ball reaches Oscar Acevedo and his left foot gives San Felipe Barcelona the 1-zip lead. 4 minutes later, Thomas Castro uses strength and skill to get this ball inside the box to Jeremy James and his left foot launch ties the ballgame at 1-apiece and the rehearsed celebration is executed. Meanwhile, Christopher Hendricks believes he’s fouled by Gaynair on this move—he reacts verbally to referee Irfan Basdemir who shows him a red card and as you can see Hendricks is obviously enraged by the card and we dare say this is not the way to handle your business on the football field. Despite the numerical disadvantage, it’s still San Felipe with the chance to steal the Win when Gaynair makes this defensive error however; Harvey Cruz can’t come up with the conversion as the match concludes in a 1-1 stalemate. 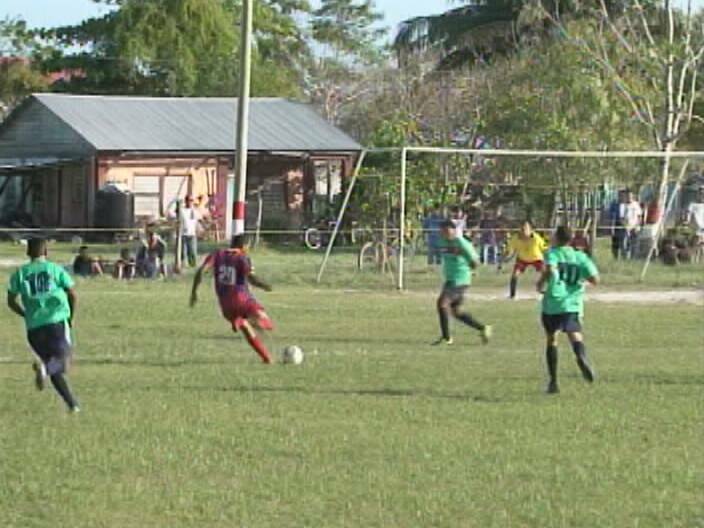 In other action around the league , the Belize Defence Force got 2 goals from Marlon Meza and 1 from Richard Jimenez to blank Juventus 2-zip, San Pedro Seadogs doubled World FC 4-2 at the MCC Grounds on 2 goals from Kenny Witz and 1-apiece from Francisco Mejia and Jesse Smith. Placencia Assasins crushed Hankook Verdes with a 4-zip blank on 2 goals from Luis Torres and 1-apiece from Derrick Torres and Ernie Whyte. 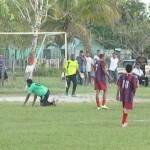 Police United pounced on Paradise Freedom Fighters for the 2-nil Win on goals from Lennox Castillo and Orlando Jimenez while the Belmopan Bandits held San Ignacio United to 1-2 draw inside the Norman Broaster Stadium. Woodrow West put the Bandits ahead from the penalty spot but Defour replied for the West. 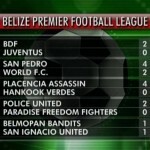 Looking to the weekend 2 matches are set for Saturday in the PLB: World FC will host Juventus at the Norman Broaster Stadium and Police United travels to the Belmopan Bandits. On Sunday at 3:30 p.m., San Felipe Barcelona will host the B.D.F. At 4 p.m., FC Belize will host San Pedro Seadogs inside the MCC Grounds. 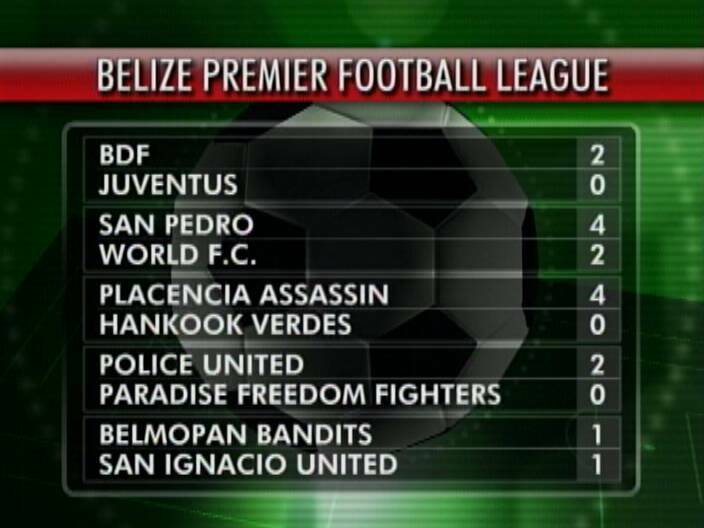 The battle for Cayo will be staged at Benque Viejo where Hankook Verdes goes against San Ignacio United and at Placencia; Placencia Assassins gets a visit from Paradise Freedom Fighters. 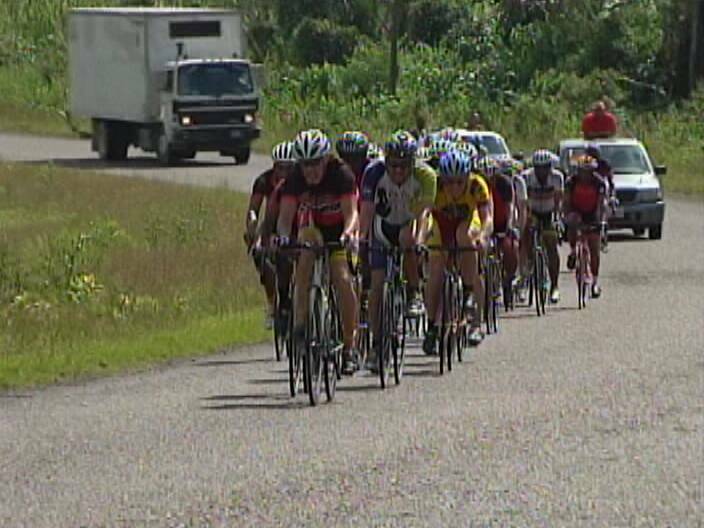 Turning to cycling news, 28 riders suited up for race 4 in the Weekend Warriors series at the A class level in a 39 mile ride that left Belmopan Comprehensive and headed to St. Margaret Village then swing back to finish where they started. At the turnaround point it’s Kenroy Gladden of Horizon in the lead, but the pelathon remains in immediate striking distance as they begin the journey back to the finish line. We fast forward to the finish line and around the curve it’s Kenroy Gladden challenging Ernest Meighan but Jaw-Meighan of Santino’s easily takes the Win as Gladden of Horizon settles for 2nd. Team Stewart of MOH then edges out Barney Brown of Scotiabank for 3rd place while Wilbert Jones of BCB/FT Williams rounds out the top 5. For the record, Barney Brown wins the Veterans Class, Andrew Poppa Brown takes 2nd place and Collet Mejia is 3rd. Meanwhile the Master B Class 28 mile race was won by Jose Moguel of Cayo Rentals, Mark Lisbey of BCB/FT Willaims finished 2nd and Geoffrey Waight of Cayo Rentals round out the top 3. Incidentally folks, Ernest Meighan leads the series overall with 125 points. Race 5, the Individual Time trial comes up this Sunday, February 26th. 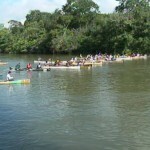 Finally folks, the Belize canoe Association presented another race on Saturday as they prepare for the 2012 La Ruta Maya. 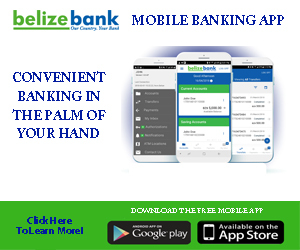 This time the race travelled from Burrell Boom to Belize City and again the finish found the usual big 3 in a battle for supremacy—and again it’s Zip Rider edging the Belize Bank this time by 5.6 seconds while NICH pills up 3rd. in the mixed class, all in took top honors with Oceana 2nd and Missile 3rd. print Belize prevailed in the Pleasuire class beating the Belize Defence Force by over 10 seconds. 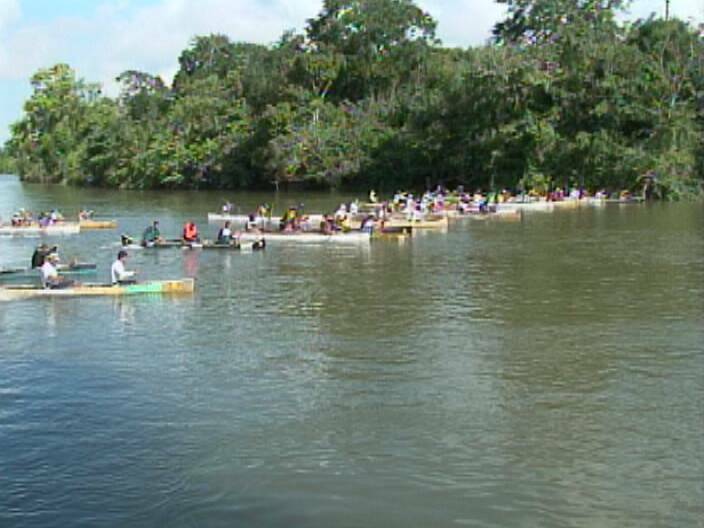 The Belize Police Department won in female class and in the master class, it was Watta Ting with the Win.